378 customers have given this product a 5-star rating. Of these, 365 customers have written no texts or given their feedback in another language. 160 customers have given this product a 4-star rating. 26 customers have given this product a 3-star rating. So I bought this to extend some of the options I have with the GT-100, as this specific pedal, along others is specified in it's manual. Also I'd rather tap tempo on this then on the GT-100.. the FS-6 is easier to replace if there's a lot of wear and tear or the button get's messed up. However it's build better then I had thought originally. As is the case with BOSS I find their products always very well made. -Sturdy. It has a solid aluminium top, you can stomp on it all day long. So more then what I expected when I opened the box and saw that it's build like this. Thought I was some sort of plastic. -Easy to set up. Bought a stereo to 2x mono jack cable to hook it up and it worked first try no questions asked, as a reference I used the polarities mentioned in the GT-100 manual. Worked like a charm. -No power supply. No searching for an empty power supply on stage. Turns on when you feed it a cable. -Came with a battery so I could just start using it without having to go the store or whatever. I was really happy with this. I went straight to mapping my effects. -The switches are plastic, but their solid. I actually have to press a bit harder on them cuz sometimes I just tap them too lightly. That being said I think they will last for a looong time. -It's not a battery eater. It'll last you a few shows for sure. -Power indicator if the battery get's low. -No on/off switch, runs on a 9V battery. If you plug a cable into it, the power LED goes on, and it stays on until you pull everything out of it. -No power supply. I know I said this is a pro. It all depends on what you prefer. I'd rather not carry another power supply with me. But some people might prefer that as an alternative to batteries. -Because it's weight is like 470g.. on some surfaces you might find it has a tendency to slide around, if your using it outside your pedal board. The shiner the surface the more it'll slide. For example at home on my wodden floor it slowly moves as I use it. I really like this pedal. It adds the functionality I need to my GT-100. It works great, didn't have to read or document myself on how to get it working. Just got it out of the box, plugged it in an voila! Really well built. Also shipping was reliable and got the unit in top condition. Thanks Thomann. If your looking to get one I'd say just get it. It's a good foot switch that I would immediately miss if I something happened to it. If you take care of it it'll last you a few good years. 5/5 Great product from BOSS! 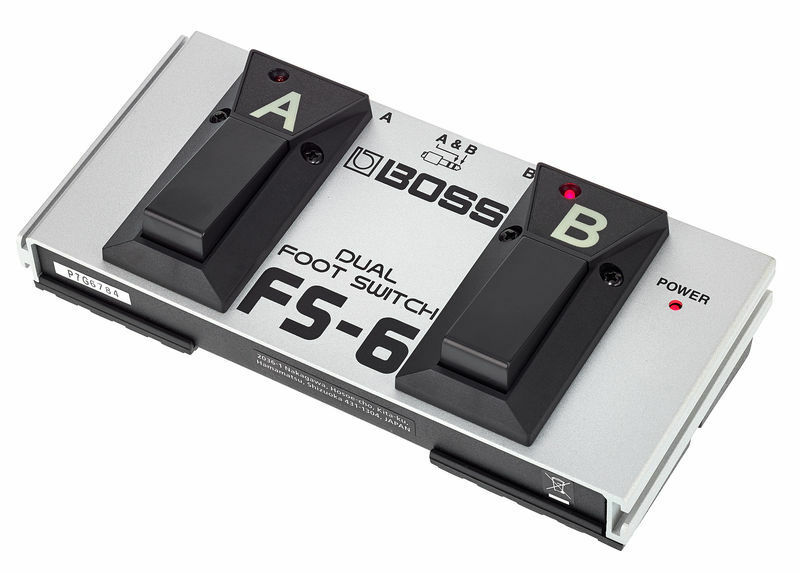 2 years I have been using the Boss FS-6 in addition to the features of the BOSS GT 100 guitar processor. Very comfortably! I have increased the number of functions with one touch of a foot, which simplifies work on the stage. The process of working with loops was especially simplified. ID: 173531 © 1996–2019 Thomann GmbH Thomann loves you, because you rock!